CMR is the manufacturer and designer of the Flowgrid which consists of a Galvanised Duct Frame made to measure in any dimensions in increments of 100mm height and 50mm width. The factory fitted Aluminium CMR Flowprobes are plumbed together to form a Flowgrid which shall be mounted in the air stream to provide an average differential velocity pressure. The Flowgrid can be fitted in any position except after a controlling damper or a duct T- Junction. Galvanised Air Smoother perforated Plate duct sections are available. The CMR Flowprobes are fitted in such a way that a bi-directional flow can be measured with the CMR P-Sensors The Flowgrids have tube push on fittings to suit a normal Building Management applications. They can be epoxy coated on request. The CMR Venturi air volume measurement devices are manufactured in galvanised sheet metal, stainless steel and PPs Plastic and all have the great advantage that they are factory calibrated and produce a differential pressure which can be used to measure the air volume accurately. They are fitted with a bracket to mount any of the CMR Transmitters. Once the transmitters are connected to the tube connectors on the venturis, the display can show linear airvolume in m/s, m3/s, m3/h, l/s or ACR airchange rate. The venturis are made in all standard spiral duct sizes up to 400mm diameter. CMR is the manufacturer and designer of the Velogrid which consists of a stainless duct frame made to measure in any dimensions in increments of 100mm height and 50mm width. The factory fitted Veloprobes are plumbed together to provide an average air velocity measurement. The Velogrids shall be mounted in the air stream to provide a differential pressure. 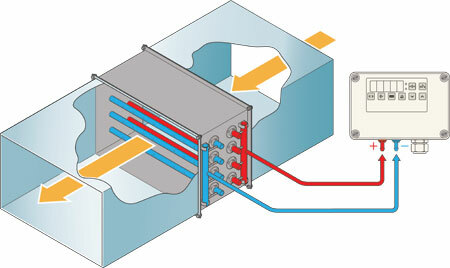 The velogrid can be fitted in any position except after a controlling damper or a duct T- Junction. Atainless Steel Air Smoother perforated Plate duct sections are available. The veloprobes are fitted in such a way that a bi-directional flow can be measured with the CMR P-Sensors The velogrids can also have compression fittings to suit high temperatures and nuclear applications and can also be epoxy or Teflon coated as an optional.